Do you ever find that you have old stock in your convenience store that you just can’t sell? Sometimes you don’t know what to do, the prices are already small, the products may look tattered and you need to fill the space with new stock that will sell faster. What can you do? We’ve put together our top 5 tips on how to manage old stock in your convenience store. Donating your stock to a local charity or organisation such as a theatre group means that you can get rid of stock quickly. You should also be able to build on marketing your convenience store by having a free ad in a programme or leaflet. Make sure that that the merchandise has a fairly decent shelf life and that the quality is good. Obviously there’s no immediate profit to be made here but you will be clearing your shelves to make way for new better selling products whilst raising your profile. This option relies on intuition, some planning and the right demographics. Let’s start with an example. You have too many carbonated drinks by unknown brands and they just won’t sell. One option would be to remove all well known brands of carbonated cola, orange and lemonade from your shelves and only display the unknown brands. Your customers will have no other choice than to buy the remaining stock – they do need to be indifferent to branding though! This might take a little bit of planning as you may want to carry out some risk management using your POS system to see how well these products sell throughout the year, there may be periods when they are more profitable than others – you don’t want to jeopardise making no profit at all. Try wrapping up the stock and giving customers a free gift every time they spend £10 or whatever amount you choose. This would be particularly successful leading up to Christmas and builds customer loyalty. Again, you won’t be making a profit on the old stock but customers may be encouraged to buy more if there is an added incentive. Try putting all the products together in a ‘bin’ and offer the products at 5 for £5 or whatever price you prefer. They should get snapped up fairly quickly. All of the above are great solutions which can be implemented quickly with little or no planning. However, it’s important to have a strategy in place so that you can forecast and plan for this situation. Using your EPOS system and accounting information (such as supplied by cloud accounting system CounterBooks) you should be able to identify patterns in stock sales and forecast when you may have too much old stock. You can then have a planned lifecycle, implementing offers such as discount sales or buy one get one free at the end of every quarter or whenever you have planned. Categories: Accounting for retail, Convenience retail, Convenience retailing, Inventory/stock management | Tags: convenience store, old stock, stock | Permalink. CounterBooks (our online retail accounting system) was one of the first accounting systems to be built for the cloud – back in 2003. Since then, there has been 100+ new systems, and now the baton has been passed to the cloud POS market. If you are still not sure what cloud POS is, or the benefits, we have found several videos of various start ups with their founders who do a great job. Let us know what think in the comments below. Categories: cloud computing, Inventory/stock management, Online Retail Accounting system, Point of sale system, Point of sale systems, Retail Accounting, Retail systems, Retail technology, saas accounting, saas computing | Tags: accounting system, business information services, cloud computing, cloud pos, Retail Technology | Permalink. Stock Taking – Why are inventories important? Profit margins can rapidly be eroded if stock is being stolen by shoplifters or staff. Where margins are low and sales volumes are high regular stock takes are essential to make sure that stock is not being stolen. For example tobacco sales margins may be as low as 7 or 8 % in some markets and the theft of a carton of cigarettes by a staff member can easily wipe out the day’s profit for a small convenience store owner. Both cost and retail prices can vary over time. Stock can also be lost through damage or theft. Accurate profit margins on a product line or sales category group can only be established if stock levels have been counted at the start and end of a period. In extreme cases the owner may be unaware that their business is failing due to the actual profit margins being far lower than forecast. To benefit fully from automated ordering it is not good enough to rely only on the stock levels calculated by a Back Office System (BOS). The data in the system is often inaccurate due to incorrectly entered delivery data and failure to adjust for damaged and out of date goods. Taking regular physical stock takes and feeding this back into the BOS will help to ensure that automatic ordering does not lead to over or under stocking. In the case of fuel sales there are statutory requirements to record inventory levels and check for losses into the environment. For convenience goods there are no equivalent requirements however most accountancy regulations require inventory levels to be determined once a year for annual tax returns. 1. Make a physical stock take monthly or bi-monthly to allow accurate profit trends to be calculated and minimise theft. The use of hand held bar code scanners has made this easier and more accurate than in the past. 2. For high value low margin items (tobacco, lottery scratch cards etc.) consider checking on a more regular basis. For example lottery scratch card sales can be easily checked as the cards have a serial number. Checking that the difference in serial numbers is equal to the number of sales recorded in the POS for a shift, day, week etc is easy to do. Categories: Inventory/stock management | Permalink. We all know that the large supermarket chains analyse the basket of goods purchased by each customer and use this information to optimise their sales offering. We also know that this requires complicated analysis software to mine the data from many stores looking for trends which are not always easy to spot. An example might be finding that a low selling stock item frequently appears in the basket of high spending customers. Simple analysis using a standard Back Office System might suggest that this item is not worth holding in stock if it is in the bottom 50 sellers however if you do stop selling it you might lose some of the high spending customers as they will go elsewhere. With a sophisticated analysis system you could test this by removing the item at some stores and see if the customers fail to return. For a retailer with one, or a small number of stores, this type of analysis is not possible. So what are the alternatives? Below we suggest a number of simple (and cheap!) ways to perform your own review of customer behaviour. They are not all strictly forms of basket analysis but they will help you achieve the right product mix in your store. 1. What am I not stocking that people need? You are running a convenience store and you see a customer enter the store. They look around the shelves and go out again. What were they looking for? The easiest way to find out is to ask them, “Can I help you, is there something you’re looking for?” If you’re lucky you may make a sale as you have the item in stock but the customer can’t find it, in this case you may want to review the planogram you are using as it didn’t work for this customer. If they are looking for something you don’t stock you can either offer to order it for them or make a note to add it to your next order if it is a new product. This can be particularly effective with products sold on a sale or return basis as you only risk having capital invested while the item is in stock. This should be obvious but the main problem here lies in staff training. If you are running a small family business most retailers will instinctively have a look at what a customer is buying and perhaps suggest a new or alternative product they think the customer would like. The problem is training and motivating your staff to do this “manual” basket analysis for you. The big supermarket chains overcome this by analysing the data coming from the POS/BOS and not relying on training staff to look for trends. You have an advantage over the supermarkets in that if you can train and motivate your staff to interact with the customers and monitor their purchases you will have information directly relevant to your store and not based on the average performance of many stores in different locations. Consider motivating your staff by having an employee of the month award for increased sales on their shift, this could be with or without a financial incentive. For an article on suggestive selling at the till see http://www.csnews.com/article-the_power_of_suggestion-1453.html . This is related to point one. Although many potential customers will enter and leave a shop without asking for information about a product they are looking for, others will ask if an item is in stock, more so if they are an existing customer and already have a relationship with the staff. Ask your staff to make a note of any requests and review them regularly to add new stock items to your orders. 4. How many sales am I losing? Try to measure the number of customers you fail to make a sale to and use this as a performance indicator to see if new strategies are improving sales. In a small retail outlet there are two ways of doing this using a simple tally counter which can be bought for a few Pounds/Dollars/Euros (see http://www.tallycounterstore.com for examples). Click the tally counter every time a customer enters the shop and then deduct the number of sales made during the day as recorded in the POS. This is easy to do and requires little concentration but can result in unquantified errors as it is difficult to account for a group of people entering the shop together to make a single purchase. Click the tally counter only for potential customers who enter and leave without buying. This requires more concentration and can become difficult to monitor if several customers are waiting to be served. (This in itself may deter customers who do not like waiting in line). Analyse the figures per day of the week over a period of time to gain an understanding of how the ratio of sales per potential customer varies. Even low price POS/BOS systems now have powerful analytical tools available to monitor sales trends by sales item and product category. If you have a promotion running monitor the sales of the promotional items and other alternative products. Don’t just sit and hope that the promotion recommended by a supplier is increasing your profit. It might be increasing overall sales of their product but not increasing your profit. Categories: Basket Analysis, Convenience retail, Convenience retailing, Forecourt Accounting, Inventory/stock management, Retail Accounting, Retail Management | Tags: basket analysis | Permalink. – FIFO stands for “first-in, first-out” – with FIFO the oldest stock items are stated as sold first. However this does not exactly mean that the actual oldest physical object has been tracked and sold; this is just an accounting technique. – LIFO stands for “last-in, first-out” – this translates into the most recently produced items are recorded as sold first. In the USA, most companies use LIFO because it reduces their taxes in times of inflation. LIFO is only used in Japan and the USA. The difference between the cost of a stock calculated under the FIFO and LIFO methods is called the LIFO reserve. This reserve is essentially the amount by which the tax has been deferred by when using the LIFO method. Due to LIFO’s potential to skew inventory value, UK GAAP and IAS have effectively banned LIFO stock/inventory accounting. Many companies will also state that they use the “lower of cost or market.” This means that if stock/inventory values were to plummet, their valuations would represent the market value (or replacement cost) instead of FIFO, LIFO or average cost. Understanding stock calculation might seem overwhelming, but it is something you need to be aware of and if you do not, you should ask your retail accountant or retail auditor. Categories: Inventory/stock management, Retail Accounting, Retail Accounting 101 | Permalink. Inventory and stock management are interchangeable terms in the context described below. There are various models which can be used by companies to have greater stock management control. Toyota is credited as the originator of this approach to have a lean and more effective enterprise through reducing muda (Japanese for waste) and muri (Japanese for excess) those familiar with lean manufacturing and enterprise will know these terms well. Although developed in a manufacturing environment the same principles can also be applied to small to medium sized retailing businesses. We will briefly look at the three main models of inventory control, Just-in-time Inventory (JIT), Vendor Managed Inventory (VMI) and Customer Managed Inventory (CMI). JIT’s aim is to allow companies to replenish stock/inventory exactly when required, hence the name “Just-In-Time”. It attempts to remove the probability of holding excess inventory and its associated costs. As a result, companies receive inventory only when the need for more stock is approaching, this has allows better cash utilisation and a high stock turnover. Take for example a retail environment where no stock storage area is available and all items are placed out ready for sale. The retailer needs to have an efficient supplier able to supply small quantities of items on a frequent, preferably daily, basis in order to keep the shelves full and an efficient stock management system which enables daily top up orders to be placed. VMI and CMI are two models that are derivatives based on the JIT principles. VMI gives the vendor in a vendor/customer relationship the ability to monitor, plan and control inventory for their customers. Customers relinquish the order making responsibilities in exchange for timely inventory replenishment that increases organizational efficiency. In the UK this is common in the news and magazine sector where delivered quantities of titles and the title mix are often automatically adjusted by the wholesaler. CMI allows the customer to order and control their inventory from their vendors/suppliers. Both VMI and CMI benefit the vendor as well as the customer. Vendors see a significant increase in sales due to increased inventory turns and cost savings realized by their customers, while customers realize similar benefits. 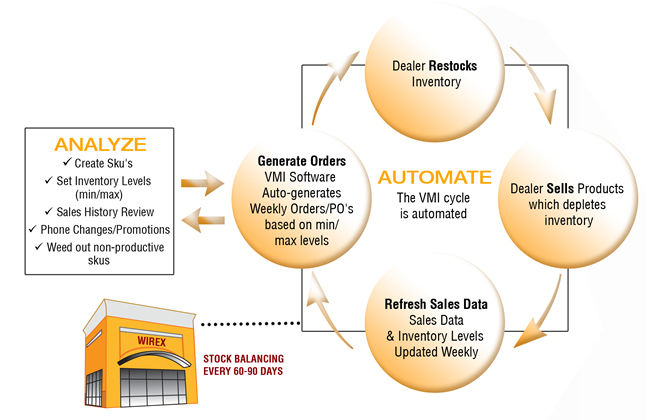 This is the principle behind automated ordering from wholesalers and is becoming increasingly common in retailing where EPOS/BOS systems are provided by a wholesaler or symbol group and prepare automatic stock orders which are checked and authorised by the retailer. Categories: Inventory/stock management, Online Retail Accounting system, Retail Accounting | Permalink. What accounting and IT systems does a retailer need? This article is intended to provide you with a summary of the systems which should be considered for the running of effective retail operation. Accounting system –This will allow you to manage your accounts and produce management and financial reports. There is an ever growing range of systems for general businesses however one which is totally designed for retailing, from POS/BOS and electronic invoicing interfacing to reporting, is CounterBooks. 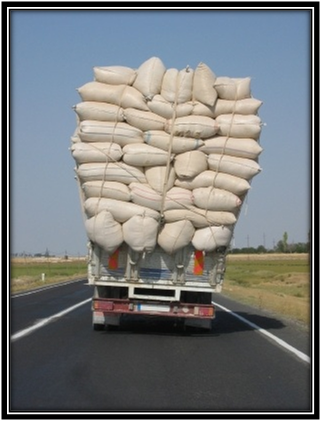 Stock management – You can quickly get a stock valuation or find out how well a particular item of stock is moving. Many systems include automatic stock monitoring, triggering orders when the re-order level is reached and automatic batch control if you produce goods in batches. Much of this functionality is now being included in even basic EPOS systems. The capacity to print a till receipt that shows a shortened product description and price. Additional modules for stock control, reporting, data export etc. are often available and are become ever more sophisticated. Demand management – coordinating sales forecasts from all the players at the point of sale through production to raw materials suppliers, so that everyone is working to the same plan, rather than creating unnecessary safety stocks. Distributions resources planning (DRP) – keeping track of the status of production and procurement of materials for each order, where the goods are in transport, what stock to keep and when to reorder. Transport management system (TMS) – this system will determine the methods of transport available to the shipper, the costs and timings associated with each route, the order in which to load transport, optimisation of transport modes, and compliance with customs and shippers. Warehouse management system (WMS) – systems to optimise the storage and picking of goods in a warehouse, including compliance with carrier and customer documentation requirements. Supplier relationship management (SRM) – information about suppliers of direct and indirect materials, such as agreed terms of trade including delivery and price associated with them, records of status, records of contacts between the company and the various points of contact in supplies. ERP/all-in-one – there is a growing trend to utilise one system which covers multiple disciplines such as finance/accounting, manufacturing, sales and service, customer relationship management, etc. Disadvantage: Cost. The systems are highly specialised with high setup and maintenance costs. Best-in-breed – by adopting various systems which are best in their class, it allows the retailer to gain maximum value and utilisation of each system and through integration and system-to-system communication transparency can be achieved. Advantage: you can use the best systems and gain the maximum value out of features. Advantage: More systems can be added from different suppliers as the size of business increases. Disadvantage: multiple systems to install and manage. Interfacing the systems may be difficult. The price of technology continues to drop and its sophistication increase. Everyone needs to keep up to date with the latest developments and use the technology appropriate to their situation to maximise profits. Categories: Inventory/stock management, Online Retail Accounting system, Retail Accounting, Retail systems | Tags: accounting systems, business intelligence, electronic point of sale, EPoS, epos systems, management & financial reports, Online Retail Accounting, POS/BOS, stock management | Permalink.